*Automatic sanding, manually setting up the object. *Patent floating revolving sanding head: long life, low power. *Consumption low-temperauture.very effective. *Shaking belt device: pro-long the longevity of the belt, high working quality. 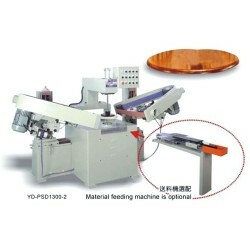 *YD-PSD1300-2 for round board, auto feed device is designed for sending board under500 m/m.